"Progress happens at the speed of trust." Maithri joined Watsi on October 15th, 2015. 17 other people also joined Watsi on that day! Maithri's most recent donation traveled 8,800 miles to support Sokhorn, a nun from Cambodia, for vision-restoring cataract surgery. Maithri has funded healthcare for 4 patients in 3 countries. Sokhorn is a 58-year-old woman living in Cambodia with her husband, three sons, one daughter, and eight grandchildren. She is a nun at the pagoda, and she "spends her time meditating, cleaning around the pagoda, and reading the Bible," says our medical partner, Children's Surgical Centre (CSC). Sokhorn has cataracts in her left eye, which causes blurred vision, tearing and irritation. Sokhorn is fearful of the sunshine and says "It is hard to see everything clearly so I can not read or go walking anywhere very well." CSC shares that Sokhorn traveled seven hours with her husband to reach their services. For $225, Sokhorn’s cataract can be surgically corrected. Cataract surgery is an outpatient surgery and takes about one hour in total. Cataract surgery has high impact for improving visual acuity and improving quality of life. "I hope my eye can see everything clearer," Sokhorn says, "so I can help the monks cook food, and I can read letters more clearly." Meet Kule, a 62 year-old father from Nepal. 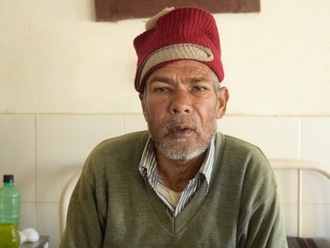 Kule has a wife and five sons, and “three of his sons work in a restaurant in India to support the family back home while two of his children are still young and live with him,” says our medical partner, Possible. Kule has chronic obstructive pulmonary disease (COPD), a condition characterized by difficulty in breathing and cough due to poor airflow. It is generally recognized by its two most common components: emphysema and chronic bronchitis. This condition may be a result of household smoke, tobacco smoking, infections and genetic deficiencies of certain enzymes. The primary source of COPD in Nepal is household smoke. The majority of people (68 percent) use firewood as the chief source of fuel in their kitchen, especially in rural Nepal where Possible is based. Additionally, 1 in 3 men in Nepal are smokers. Kule has had COPD for about four years now. He needs help doing basic activities, his body aches and he feels breathless frequently, and he sweats profusely. For $270, we can fund oxygen therapy and antibiotics to help him breathe easier and allow him to do basic activities. "When his condition was not as worse, he would help me with everyday chores - feeding the cattle and planting seeds. But now I feel that I'm keeping him alive with all my efforts," says Kule's wife. Let's help make treatment possible for Kule.